Opening July 17, 2013 in the USA and October 18, 2013 in the UK, “Turbo” tells the tale of a snail with dreams of winning the Indy 500. After a freak accident, his dreams are turned into reality as he finds himself with the opportunity of achieving the dream. Directed by David Soren and starring Ryan Reynolds as Turbo, Paul Giamatti as Chet and Luis Guzman as Angelo, the film is rated PG for some mild action and thematic elements. With a splendid cast, this film runs for 1 hour 36 minutes and is already getting good reviews. Some critics are calling the movie exciting and fun, it has potential of being the next great Animation/Family film since Despicable Me 2 came out. However, it has a lot to live up to if that is going to happen. Distributed by Dreamworks Animation, the movie seems like it has what it takes to go up against the others in the Box Office. 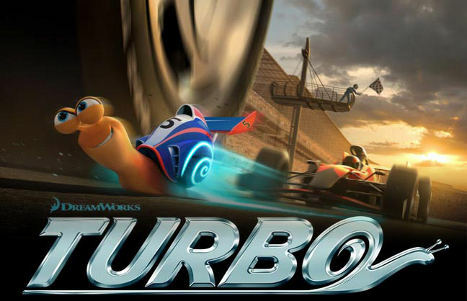 Will you check out “Turbo” when it comes out to theaters next week? Do you feel it had what it takes to make it to the top of the Box Office?